includes a new UVM report mock. Thanks to my colleague Jean-Marc Tremblay for handling this part of the upgrade. You get the expected and actual ID, MSG and severity at each index. So this dump from the mock would tell you, for example, that the error and fatal you were expecting were logged in the wrong order (i.e. you expected fatal then error, but you got error then fatal). This won’t match what you have now, so unfortunately you’ll have to go back and swap the arg order. Sorry about that :(. 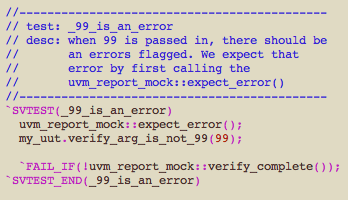 If you’re new to the UVM report mock, you catch up with my original post from a few weeks ago. I can confirm that it’s working now.